Perrine will help us revisit a familiar passage each week that prepares us for Christ’s birth. We all long for good news. Sometimes it’s for the ordinary. You’re waiting to hear back on that promotion, or maybe whether or not you’ll be approved for time off work. Sometimes it’s bigger news that will change the trajectory of a life; your friend gets engaged, one of your kids announces they’re having a girl, or your offer on that house has just been accepted. We long for good news but sometimes such news is hard. Maybe the job’s turned out to be far more difficult than you had imagined, or maybe your friend’s marriage is having trouble. Maybe it’s the toll of sleepless nights with the newborn’s arrival or mounting mortgage payments that no longer can be afforded. This advent season contains the greatest story of good news but also invites us to remember its cost. Now for as great and exciting as the “he will reign… and his kingdom will have no end” part is, I would be willing to wager that Gabriel lost Mary at the announcement, “you will conceive in your womb and bear a son.” In fact, the first thing Mary says in response is not “where is my son going to rule?” but “How in the world am I supposed to have a child when I’m a virgin!” (my paraphrase of course). After assuring her that through God nothing is impossible, Gabriel leaves Mary to ponder this promise God has made. This advent season is a period of expectation precisely because we with Mary have been offered the most wondrous of good news. Take a moment to read Gabriel’s announcement again and ponder it afresh; God is sending his own son, to sit upon the throne of David, to reign over the house of Jacob and of his kingdom to have no end. There is something wrong with the world but God is coming to make it right. Yet in this advent season of longing, we are invited by Mary’s response to ponder the cost of such news. Childbirth is incredibly painful and Mary will be marked the rest of her life by the son born out of wedlock. Joseph will become the father to a child that isn’t his. And Jesus himself will be born to suffer and die. It would seem that as Paul later on would reflect “all of creation is groaning as in the pains of childbirth”. We long for good news because God has already promised it to us, yet we each feel the groaning of life in the now and not yet. The king is coming to set everything right, and his kingdom will have no end. For this announcement we have every reason to hope with eager expectation. 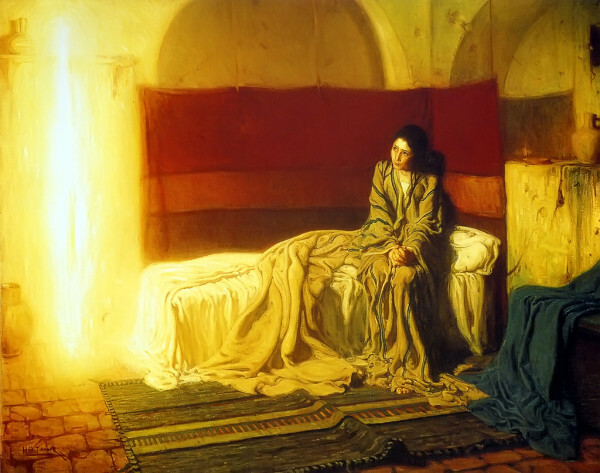 But as we prepare for Christmas and look towards the New Year, we are invited to ponder the pains of childbirth that are ahead of each of us as we longingly wait for Jesus to appear. May we together wait with eager expectation for the coming of our King.